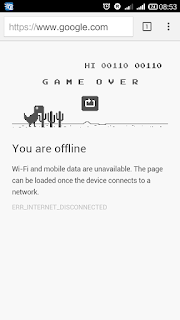 You might have seen a cute dinosaur whenever you try to access a webpage on Chrome browser but not connected to internet. There is an addictive game hidden on that page, a never-ending running game! How to play this running game? If you are on a PC, make sure your PC is not connected to internet, open Chrome browser and access any webpage say, google.com. 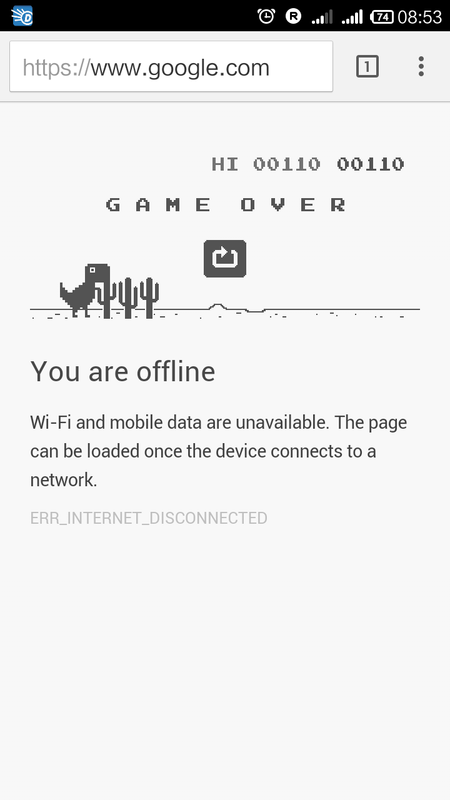 Now Chrome will display a page saying you are offline with a dinosaur image. Simply press the space bar and here you go, the game starts!!! Hitting the space bar again will make the dinosaur jump so that it can escape from the obstacles. On mobile phones, the game starts on tapping the dinosaur. Tap again to keep the dinosaur running until it hits the Cactus. You can restart the game as many times as you want. You earn points for the distance you covered and for each high score the player is greeted with a beep. High score is erased on exit or refresh of the page. The dinosaur you see on this game is T-Rex(Tyrannosaurus rex), one of the largest land carnivores of all time lived 65 million years ago. T-Rex has short arms with only two fingers, makes it difficult to grab things. What this image represents is that Chrome is having trouble reaching out to the internet. Why a T-Rex? Could be because you are living in the dinosaur age with no internet at all! You can reduce your frustration by playing this game if there is an internet outage instead of staring at the offline page as in Internet Explorer. The T-Rex image and sound designs were done by Google Chrome designers Mr.Sebastien Gabriel, Alan Bettes and Manuel Clement where the game was entirely coded by Mr. Edward Jung. Liked the game? Share your feedback below. There is an android app of the game too ... so you need not go offline everytime. Exactly the same, stores the high score too!